Carte de la Louisiane et Pays Voisins. Colton's Map of the State of Alabama. 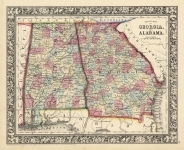 County Map of Georgia and Alabama.